Chicago Fire made many changes in the MLS season 2017. They signed expensive foreign players to get good results in the league. In the (Eastern Conference) they finished at top 3rd place and made their place in the knockout rounds. Veljko Paunović is current head coach of the team and looking for comfortable wins. 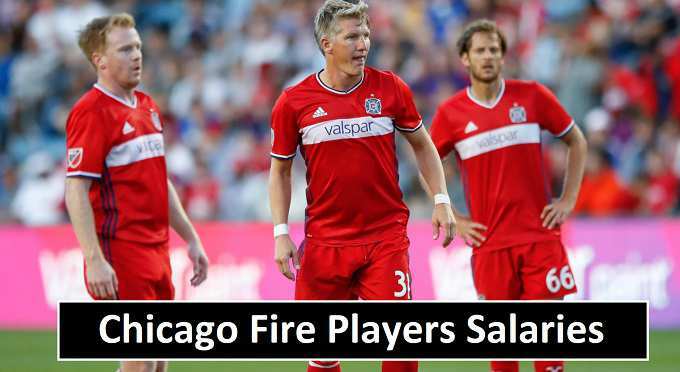 Here you will see the actual salaries and compensation paid to the Chicago Fire players. The salary details taken from the top trusted sources. The cap salary mention in the given table is taken on (4th April 2017). New transfer player salaries not mention because its not public so far by the MLS sources. The highest paid player in the squad of the Chicago Fire squad is German midfielder (Bastian Schweinsteiger) with salary of ($5.4 million) and then (Nemanja Nikolic) who earned almost $1.7 million salary from the club. The budget for cap salaries increased by the club in last two years. Chicago Fire spend $12.5 million on base salary of the players which include (Supplemental rosters and Reserve rosters) salaries. But if we include the all the salaries such as bonus and guaranteed salary the budget move from ($12.5 million) to $13.2 million a year in 2018.